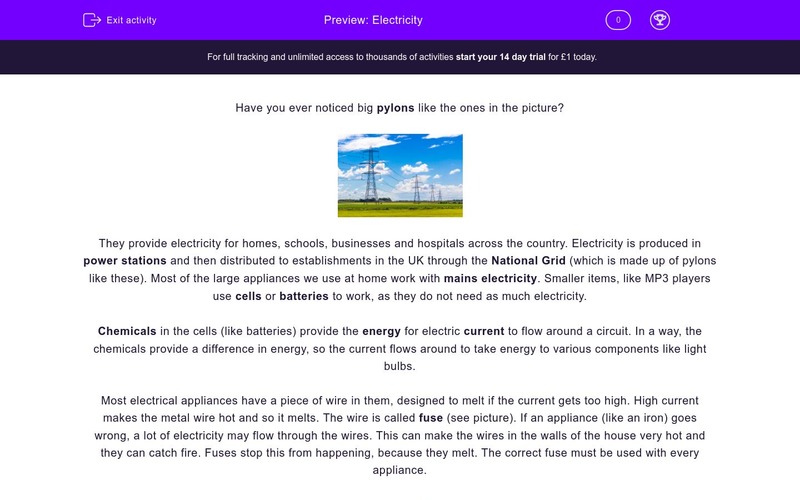 In this worksheet, students learn what electricity is and how do electrical circuits work. Have you ever noticed big pylons like the ones in the picture? They provide electricity for homes, schools, businesses and hospitals across the country. 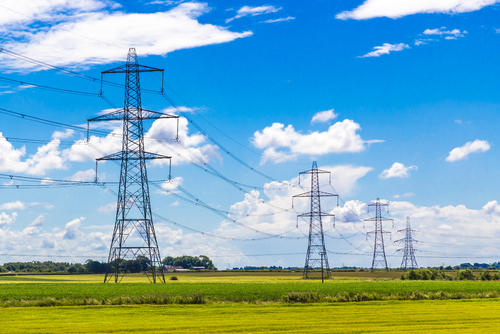 Electricity is produced in power stations and then distributed to establishments in the UK through the National Grid (which is made up of pylons like these). Most of the large appliances we use at home work with mains electricity. Smaller items, like MP3 players use cells or batteries to work, as they do not need as much electricity. Chemicals in cells provide the energy for electric current to flow around a circuit. In a way, the chemicals provide a difference in energy, so the current flows around to take energy to various components like light bulbs. Most electrical appliances have a piece of wire in them, designed to melt if the current gets too high. High current makes the metal wire hot and so it melts. The wire is called fuse (see picture). If an appliance, like an iron, goes wrong a lot of electricity may flow through the wires. This can make the wires in the walls of the house very hot and they can catch fire. Fuses stop this from happening, because they melt. The correct fuse must be used with every appliance. Light bulbs have thin metal wires in them called filaments. If the filament gets hot enough it glows. This is what happens when electricity flows through it. Filaments have high resistance. This means, it is very hard for electric current to flow through them. All materials are made of tiny atoms and all atoms have smaller particles in them called electrons. In some materials, electrons move around easily. An electric current is a flow of electrons and it carries energy from the cells or the mains electricity to the components. Metals are conductors of electricity, because electrons inside them can move around easily, so electricity is transferred from electron to electron. In electrical insulators, such as plastic, electrons cannot move around easily, so electricity does not flow through the material. It is easy to understand what happens in a circuit, if we use models. The table shows how an electrical circuit is similar to the central heating system in your house. What is the name of the system that distributes electricity around the UK? What do chemicals in cells provide that makes electricity flow around a circuit? Electrical appliances have a small wire inside them that protects our house from electrical fires. What is it called? Light bulbs have a thin wire inside them. What is it called? What do filaments have that makes it hard for electricity to flow through? Atoms have smaller particles inside them that make up the electric current when they move. What are they called? What represents a cell in the central heating model? What part of an electrical circuit does water flowing around the central heating system represent? Electricity is produced in power stations. The National Grid distributes electricity around the country. N and G must be capital. Chemicals in cells provide energy, so that electric current flows around circuits. A fuse is a small electrical wire in electrical appliances that melts when it gets too hot. 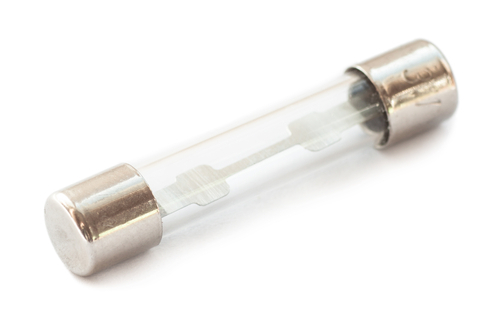 Light bulbs have thin wires inside them called filaments. Filaments have resistance and that makes it hard for electric current to flow through. All materials are made of atoms. Small particles inside atoms are called electrons. Electric current is a flow of electrons. The boiler represents the cell in a circuit. Water represents the flow of electron, which is the electric current in a circuit.